Softmouth trout from the River Vrljika – Salmo obtusirostris ssp. The the town of Imotski (Croatia) was first described by Heckel in 1851. This was, as a matter of fact the only relevant information referring to the Vrljika softmouth trout. According to Mrakovčić and Mišetić (1990) this population was considered extinct. Nevertheless, during our field trip in 2004, we observed several softmouth trout there (see Schöffmann, 2004) and obtained samples for DNA analysis. 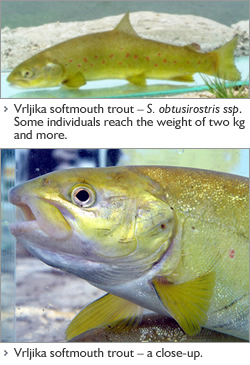 Inferred from molecular genetic data, the Vrljika softmouth trout seems to be most similar to the subspecies of softmouth trout from the River Neretva although some autapomorphies do exist in the Vrljika population. Vrljika softmouth trout appear to have originated from a vicariance that split a common ancestral population into large (Neretva) and small (Vrljika) fragmented populations 135 000 - 270 000 years ago (Snoj et al., 2008). The Vrljika softmouth trout is the only known softmouth trout population that does not co-exist with brown trout. Morphological data are not yet available to compare Vrljika and Neretva softmouth trout in detail, but the genetic research and overall external appearences indicate that Vrljika softmouth trout should be given the same taxonomic status as the other geographically separated populations and recognized as a fifth entity within the softmouth trout species complex (Snoj et al., 2008). Heckel J.J. 1851. Akad. Wiss. Wien, 347-390. Mrakovčić M, Mišetić S. 1990. J. of Fish Biol., 37 (Suppl. ): 241-242.